TRAVERSE CITY, MICH -- Rockford IceHogs head coach Jeremy Colliton faces a new roster with new talents and new challenges in his second year behind the bench at the annual NHL Prospect Tournament. However, the ideal end result remains the same as last year: Take home the championship. Entering the tournament, Colliton welcomes the challenge of balancing preparation for the upcoming season and driving results on the ice. It’s a similar process he excelled with during the 2017-18 season with the IceHogs, preparing players for a potential call-up with the Blackhawks while also fueling a push to the AHL’s Western Conference Finals. For Colliton, the challenge is a welcomed perk of the job. Last season’s Prospect Tournament saw 17 future IceHogs skaters contribute behind a red-hot Alex DeBrincat to lead the Blackhawks prospect team to a tournament championship. That squad featured the IceHogs’ eventual 2017-18 leading goal scorer, Matthew Highmore, and overall scoring leader, Anthony Louis, alongside other prominent names in David Kampf, AHL All-Star Carl Dahlstrom and rookie sensation Collin Delia. This year, Colliton will be guiding a 2018 Prospect team that boasts three first-round draft picks in Adam Boqvist, Nicolas Beaudin and Henri Jokiharju, an Olympian in Dominik Kahun and several collegiate standouts headlined by Beanpot winner Dylan Sikura. Case in point, DeBrincat in 2017, who led the preseason tournament with five goals, excelled in training camp to earn a spot on the Blackhawks’ regular-season roster and eventually paced Chicago with 28 goals during his NHL rookie season. Led by Colliton and IceHogs assistant coaches Sheldon Brookbank and Derek King, the Blackhawks Prospect Team will open pool play in the 2018 Prospect Tournament Friday at 3 p.m. (CST) at Centre Ice Arena in Traverse City, Michigan. The team’s first contest is a rematch of last year’s championship against the Columbus Blue Jackets prospect team. 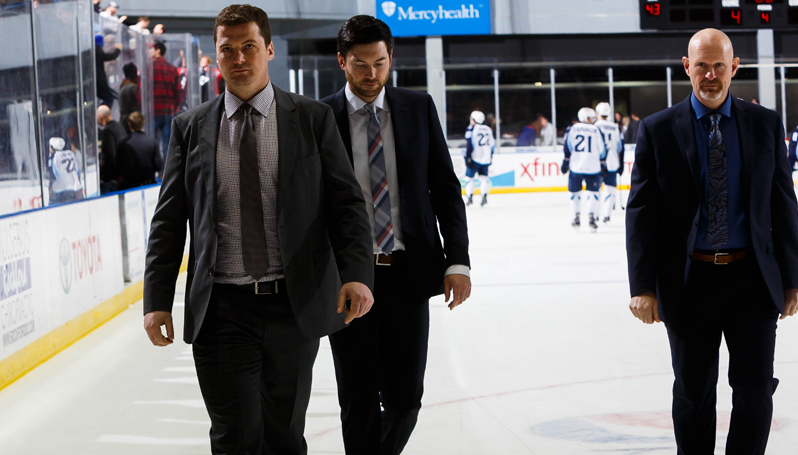 While repeating as champs will certainly be important for Colliton and his staff, the IceHogs bench boss is also keen on repeating his successful balancing act between achieving results and driving development. CLICK HERE to view the complete game schedule and stats from the ongoing tournament.